When tasting bourbon, I generally get a smell from it that I call “bourbon.” Fancy, I know. So from this point on, I think I’ll only comment when a new bourbon has a smell element to it beyond that distinctive bourboness. And Buffalo Trace does: a little bit of citrus that I’m calling kumquat. It’s light bodied for a bourbon, has a mild greasy residue, and has a lot of spice. Allspice is the strongest taste to me in that mix. I’m reminded, yet again, of my younger days spent eating many weeds that I probably shouldn’t have. This one reminds me of sucking on dandelion stems but woodier. Bet there aren’t that many drink bloggers who use childhood adventures as tasting notes, are there? 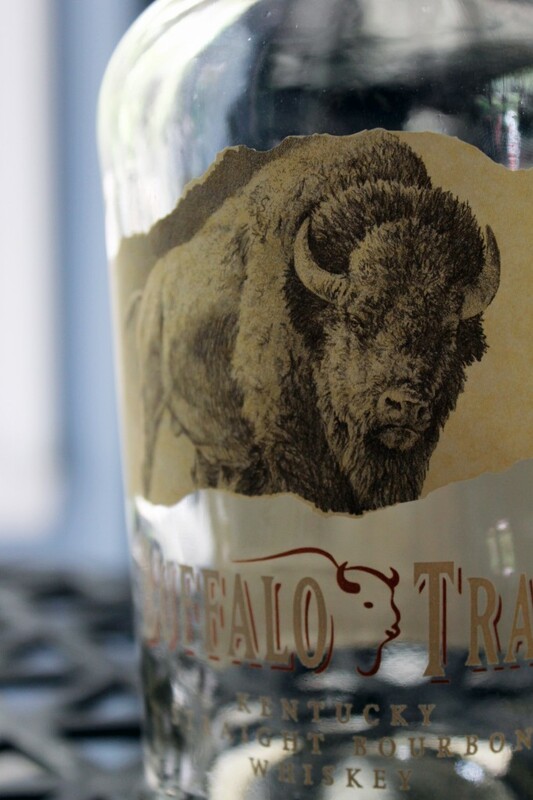 In other words, Buffalo Trace makes worthwhile bourbon that’s just a tad cheaper than the top shelf offerings. I find this to be a surprisingly complex whiskey for this price category. . . . Instead of clubbing you over the head with one or two dominant flavors, BTKSBW treats you to a vast array of aromas to draw you in, flavors to keep entertained and a finish that lingers, just long enough to last you until the next sip. . . . The slightly rosy amber hue in the glass is almost as appealing as the nose of caramel and fall apples, vanilla, oak and mulling spices. The tiniest little bit of heat greets your lips, then dissipates allowing a plethora of flavors including, but not limited to; cinnamon, allspice, leather, apple, light maple syrup, smoke, tobacco and ginger. You don’t taste them all at once, more like in waves, washing over your taste buds. There was some the crispness of a rye but not enough to overtake classic bourbon character. My first glass of BT was surprising. I was expecting more burn and less flavor for the price they put on this bottle but instead got a nice broad flavor profile to go along with the burn. Let me say that the first drink was a kick in the mouth, a little reminiscent of Knob Creek with the punch, but mellowed out pretty soon after it and gave a nice and sweet (if very short finish). I would say the strength of this whiskey would be its bold wood and rye flavors. . . . The invariable weakness of the whiskey is the finish. The oak finishes strong, but it doesn’t last very long and the burn that comes along with it doesn’t diminish, even after letting my ice open flavors fully.